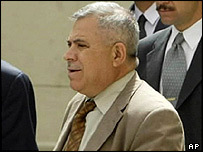 An Iraqi interim deputy foreign minister, Bassam Qubba, has been killed in an attack in the capital, Baghdad. A foreign ministry spokesman said unidentified gunmen fired on his car in al-Azimiya district on Saturday morning as he was on his way to work. Mr Qubba, the ministry's senior career diplomat, was shot in the stomach. He was taken to hospital but died shortly afterwards, the spokesman said. His driver was also hurt but there are no details so far of his injuries. The foreign ministry spokesman said he was shocked but not surprised by the murder of Mr Qubba. He expected such attacks to increase as the handover to the interim government on 30 June neared. BBC regional analyst Attila Kulcsar says the killing underlines the challenge facing Iraq's new government, which has been given legitimacy by the United Nations but now faces the test of whether it can do anything to curb the violence. Armed Iraqi groups are determined to derail the process with attacks on Iraqi security forces and politicians who they see as collaborating with US-led occupying forces, he adds. However, radical Shia cleric Moqtada Sadr - whose militia has fought US forces since March - has now issued conditional support for the interim Iraqi government, which he earlier rejected as a US puppet. He has also urged his supporters to stop attacking Iraqi security forces. The attack on Mr Qubba was the second on members of the interim government in the last four days. On Wednesday, Deputy Health Minister Ammar Safar escaped an attempt on his life in the same district while he was on his way to the health ministry. Gunmen opened fire on his car and then fled the scene as Mr Safar's guards returned fire. Mr Qubba, 60, was one of several deputy foreign ministers, and was responsible for legal issues. He had served as the acting chief of the Iraqi mission to the United Nations in New York and as the Iraqi ambassador to China. Azimiya is a predominantly Sunni Muslim district whose residents were strong supporters of Saddam Hussein's regime before it was toppled by US-led forces last year. "It's just a month since Iraq was robbed of another top leader"